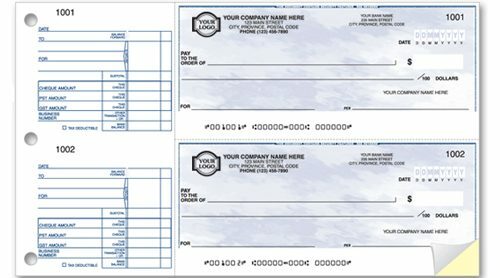 Order custom color cheques for businesses. - Print and Cheques Now Inc. Huge Savings on Business Cheques and Personal Cheques and other printing needs. Custom color cheques are often used by customers to make their companies stand out. Most companies use a logo on there Letterhead, Business Cards and Envelopes but did you know you can also get your company logo printed on your cheque stock. Logos printed on cheques can also offer a cost savings compared to custom printed envelopes as the logo printed on your cheques can be positioned to fit within a standard Double Window Cheque Envelope so you no longer need to use printed envelopes for the cheques you mail out. Custom color cheques with logos can be printed in various ways. Most common is that we can print your custom logo overtop of any of our standard cheque colors. This is the most cost effective way to print them and provides the highest security features for the lowest price. The 2nd option is to print the background using any 1 of your custom logo colors as the cheque background color. This option is great if you want ultra custom looking cheques. However if you want the Hologram Gold Foil to be added it costs an extra $40/1000 cheques to put it on. Whereas if you print over our standard Top/Middle cheques the Foil is included already in the pricing. If you have any question regarding prices or to receive a quote on a custom cheque order please call me.